Vanuatu’s President Baldwin Lonsdale says that Cyclone Pam has “wiped out” development in his country amid ongoing concern over residents of the Pacific nation’s outlying islands. Aid has begun arriving in storm-hit Vanuatu – one of the world’s poorest – where trees and power lines have been felled and many buildings destroyed. Aid agencies say it could be one of the worst disasters ever to hit the region. The situation on some remote islands closer to the eye of the storm is not yet known as communications are down. Almost every house in Vanuatu has received some damage. Aerial images of the capital show houses completely flattened. 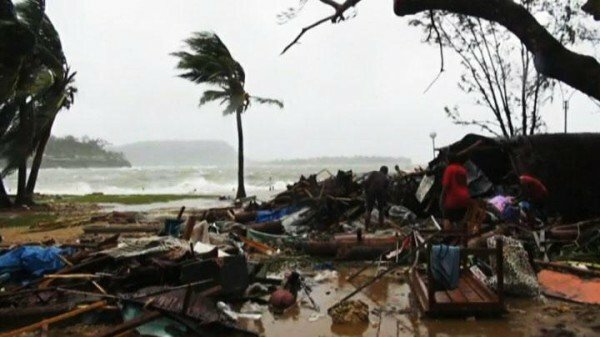 The official death toll is eight, but this is expected to rise as rescuers reach more the remote islands. Speaking in Japan where he had been attending an international conference on disaster preparedness, President Baldwin Lonsdale called the storm “devastating”. “I term it as a monster, a monster – it’s a setback for the government and for the people of Vanuatu,” he said. Baldwin Lonsdale also said he had not been able to confirm that his own family was safe. The president said climate change had contributed to the disaster, saying Vanuatu had seen changing weather patterns, rising seas and heavier-than-average rain. Cyclone Pam, a category five storm, with winds of up to 185mph, struck populated areas when it reached Vanuatu early on Saturday, March 14. It is now moving down the east coast of New Zealand. The storm has weakened significantly but about 100 people have been evacuated from coastal areas in Gisbourne, on the east of the North Island. An alert is also in place in the Chatham Islands, about 425 miles south-east of Wellington. UNICEF worker Alice Clements in Port Vila said all the power lines were down, and many staff of the capital’s only hospital were unable to get in to work. There is major concern about islands to the south, including Tanna, which was in the direct path of the storm. The Australian Red Cross tweeted that it had heard of “utter devastation” there. Paolo Malatu, co-ordinator for the National Disaster Management Office, told the Associated Press news agency that planes and helicopters had been sent to fly over the islands and assess the situation.